How do I use it clinically? What Auditory Processing areas are tested? How do the APD treatments work? 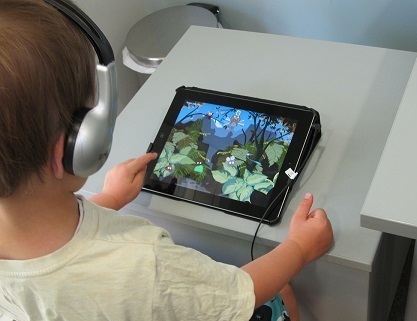 Feather Squadron is an extremely engaging and quick way to thoroughly measure auditory processing abilities. OBJECTIVE: This research investigates a novel method for identifying and measuring school-aged children with poor auditory processing through a tablet computer. DESIGN: Feasibility and test-retest reliability are investigated by examining the percentage of Group 1 participants able to complete the tasks and developmental effects on performance. Concurrent validity was investigated against traditional tests of auditory processing using Group 2. STUDY SAMPLE: There were 847 students aged 5 to 13 years in group 1, and 46 aged 5 to 14 years in group 2. RESULTS: Some tasks could not be completed by the youngest participants. Significant correlations were found between results of most auditory processing areas assessed by the Feather Squadron test and traditional auditory processing tests. Test-retest comparisons indicated good reliability for most of the Feather Squadron assessments and some of the traditional tests. CONCLUSIONS: The results indicate the Feather Squadron assessment is a time-efficient, feasible, concurrently valid, and reliable approach for measuring auditory processing in school-aged children. Clinically, this may be a useful option for audiologists when performing auditory processing assessments as it is a relatively fast, engaging, and easy way to assess auditory processing abilities. Research is needed to investigate further the construct validity of this new assessment by examining the association between performance on Feather Squadron and objective evoked potential, lesion studies, and/or functional imaging measures of auditory function. As an audiologist, it is up to you as the professional to use the tools available and apply them the best you can for each client you see. We do not diagnose APD with 'Feather Squadron'; Only you can do that. There are different criteria for diagnosing APD and should you need further information regarding that we would refer you to the AAA and ASHA recommendations. 2) Full Diagnostic assessment (including OAE's and Reflexes if available). 4) Add any additional assessments you feel warranted if you need to dig deeper in any areas you do not feel confident with, such as repeating a different dichotic task if you felt the child wasn't paying attention during the test, and although we find this necessary on occasion, it is very infrequently required. For children aged 5-7, the assessment is less intense and takes around 12 minutes, and for those tested from aged 8-65 the entire assessment takes around 25-30 minutes and measures about 10 different auditory processing areas. Yes. See more detail in the IJA, 2015 publication, however for the results to be accurate, the Koss UR10 headphones must be used with the iPad volume set to 50%. Ah.... The best part. It is all compared to same-aged norms automatically! A HUGE TIME SAVER and a report is generated automatically as well! As with any sort of therapeutic intervention, routine training is needed to bring an underdeveloped ability up to where it should be. Always starting at the level achievable (or slightly below) and slowly increasing the difficulty level at your client's own pace. We have developed training tools that can be used in clinic or at home alongside already existing clinic based treatments. We have seen some clients finish an auditory training session successfully within 2 weeks and others take over 2 months. It's very client dependent.